With a bar that seems a mile long, a whisky portfolio that you could taste all year long and the recently launched grills served at the table, the only thing missing from Whisky Samba was a touch of Asia. That gap is filled by an all-you-can-eat lunch pop up by DimSum Bros. If you’ve ever eaten at DimSum Bros you’ll know that they mainstreamed the entire concept of steamed and pan-fried savory bites and ‘meals in a bowl’. If you miss that menu, then this is your chance to relive it and that too at an iconic bar like Whisky Samba. So, this is how it flows with the unlimited menu: we were presented with a sheet on which we could mark our choice of DimSum and that’s not all, we could order them as many times as we wanted. The menu was segregated into pork, chicken, seafood and vegetarian. We suggest you have a portion each of the pork and seafood, since each portion has two pieces. With a selection of 26 dimsums, from steamed to pan fried and even baked, the ones to induce real DimSum Bros nostalgia have got to be pork pastry, prawn hargao, pork char siu pao and chives and water chestnut dumpling. 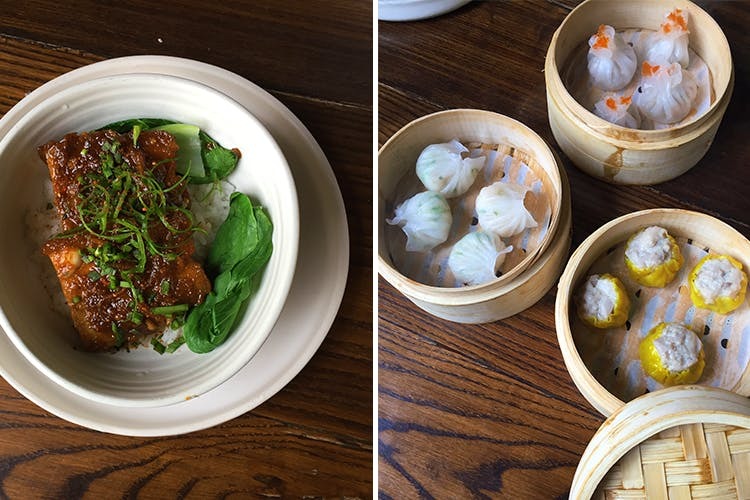 Another concept that DimSum Bros. brought to the forefront was meals in a bowl. For this pop up they have four of their finest. Fish in chilli soya, chicken Korean sauce, pork in ginger hoisin and tofu or vegetables in black bean sauce which can be ordered with either steamed or sticky rice. We suggest you don’t miss the pork and the fish! Make lunch a momentous occasion with a blast from the past and dig into unlimited dimsum, there’s a package with beer too!